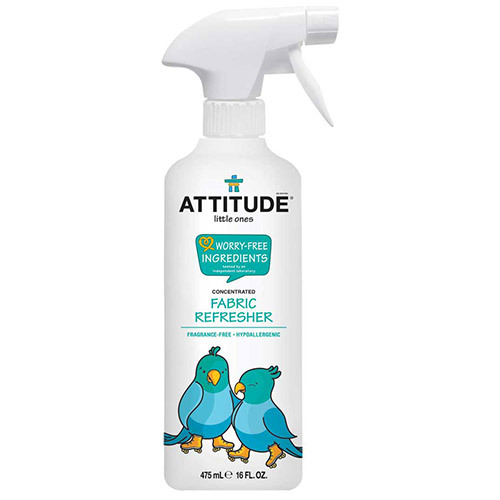 ATTITUDE`s Little Ones Fabric Refresher is 100% safe, fragrance-free and worry-free, using only plant and mineral based efficient and hypoallergenic ingredients. Alcohol (<5%), zinc ricinoleate - plant derived odours absorber (<5%), lauryl glucoside (<5%), myristyl glucoside (<5%), sodium iminodisuccinate (<5%), aqua (>30%). Spray fabric until slightly damp. This is a fragrance-free product to eliminate and/or reduce odours, depending on their intensity. DO NOT use on fabrics that water spot. Avoid spraying on finished wood surfaces. Always check label for special instructions. Below are reviews of ATTITUDE Little Ones Fabric Refresher - Fragrance Free - 475ml by bodykind customers. If you have tried this product we'd love to hear what you think so please leave a review.